A large failed project is like a huge truck stalled on the side of the highway. Both must produce critical deliverables in a timely manner to achieve the benefits that stakeholders are expecting, but they’re slowing down traffic and causing other resource and organizational problems. Both need to be restarted and put back on track. Restarting a truck seems straightforward enough. But what about a failed project? This feature was inspired by a Community Post suggestion box entry from Mary Maxwell of Dublin, Ireland, who has worked in project management for 18 years. Rather than dealing with these issues individually, it is important to take a step back and recognize the systemic issues that are causing these problems as you try to jump-start your project. The best way might be to approach it as a program, instead of a project, which can give you a better perspective with additional control and benefits. Often, large projects that have multiple stakeholders with different objectives, along with multiple sub-projects and dependencies, are really programs and can benefit from a program approach. Issues that lead to failure typically emanate from one or more of the three themes of program management—stakeholder management, governance and benefits management, which are discussed in The Standard for Program Management—Second Edition. As you plan to restart, align your approach with these themes. Stakeholder management addresses active management of expectations and interests of stakeholders to ensure their continued support and appropriate participation in the program. As you restart, reassess and clarify sponsorship. Make sure you have identified all the stakeholders, including stakeholders who were missed initially but should have been engaged. Also, re-engage the stakeholders and communicate the renewed vision of the program, seek their support, and reset expectations and understand their current needs and concerns. Program governance, as defined in The Standard for Program Management—Second Edition, is the process to develop, communicate, implement, monitor and assure the policies, procedures, organizational structures and practices necessary to run the program. Governance is like the markers or dividers on the highway that provide a framework so drivers can operate vehicles comfortably with a sense of order. Similarly, without a framework, both your cars and your programs won’t know where to go. To restart, establish a program management office as a governance mechanism. Re-evaluate existing governance processes and find ways to simplify and reduce redundant and bureaucratic layers that did not work previously. Establish a stage-gate process to analyze the program at critical stages and make go/no-go decisions, helping to ensure that potential problems are caught in time. Benefits management is the process to identify, define, align, prioritize, maximize and sustain the benefits provided by the program. In large project or program environments, stakeholders often want to see results and outcomes in the form of quick-wins and benefits along the way. A big “a-ha!” moment for the program manager is to realize the program team needs to shift its focus from task and milestone completion to the delivery and achievement of incremental benefits that meet stakeholders’ needs and expectations. 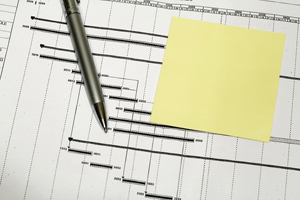 While restarting, it is imperative to create a benefits realization plan. Start with a benefits breakdown structure, which includes the schedule and responsibility for delivery of the benefits, as well as the metrics to measure the achievement of the benefits. A failed large project can have a lot of negative sentiments, or “baggage,” associated with it. While it is challenging to restart it, you can engage stakeholders to create a sense of purpose and vision for the renewed program when you recognize that it is indeed a program, and use the appropriate focus. The emphasis on governance provides the mechanism to put the program back on track. Benefits management ensures the program is on target to achieve the expected benefits. Mr. Duggal is the managing principal of Projectize Group LLC, specializing in next generation training, consulting and tools, and a PMI SeminarsWorld® leader of the seminar Building a Next Generation PMO and Portfolio Management. For questions on the content of the seminar, or your comments and feedback, please contact Mr. Duggal. © 2018 Projectize Group LLC. All Rights Reserved.